Parallel Quantum Solutions (PQS) manufactures parallel computers with integrated software for high-performance computational chemistry. 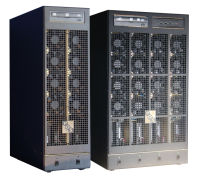 Our systems have an exceptional performance/price ratio, and are fully configured for parallel computations "straight out of the box". We intend to provide chemists, biochemists, pharmaceutical scientists, material scientists and others interested in modeling chemical systems with an inexpensive, easy-to-use tool. Although our current product is aimed primarily at ab initio modeling, we are extending our capabilities to semiempirical, molecular mechanics and dynamics methods. The high computational demand of most ab initio calculations requires parallel processing to achieve reasonably fast turnaround. General purpose parallel computers are very expensive and are usually shared between many users, negating most of the advantages of parallelism. Parallel computational chemistry programs are expensive and difficult to set up. Our systems, built using personal computer technology, are fully competitive with expensive general-purpose parallel computers (see our benchmarks) at a fraction of the cost, allowing ownership by individual researchers or small groups. To ensure reliability we use exclusively highly quality parts and technocgi-bin/logies. Our computers come with the PQS suite of programs fully configured and ready to use. PQS was founded in 1997 by Peter Pulay, Jon Baker and Krzysztof Wolinski.